A brief pan-cook in a little butter or olive oil is all that is required to create a simple, yet flavorful side dish of sautéed mushrooms and onions. The simple side is also a welcome addition to pasta sauces and stir-fries and is right at home nestled on top of steaks and casseroles. The addition of fresh herbs and seasonings, a few splashes of a flavorful cooking liquid or ingredients such as green bell pepper allow the cook to create flavors that will complement any accompanying dishes. 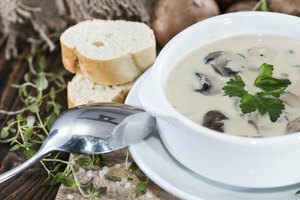 Clean mushrooms before cooking, using a damp paper towel or a soft-bristled brush to remove any dirt or grit. Because mushrooms readily absorb moisture, cleaning with water should be avoided. However, really dirty mushrooms or those with hard-to-clean areas can be briefly rinsed with cool, running water, then patted dry to remove excess moisture. 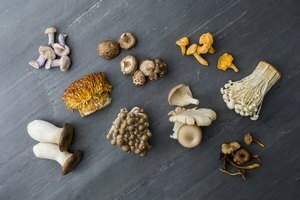 Trim the ends of stems or remove them entirely from varieties like shiitakes that have tough stems. To ensure even cooking, slice, quarter or dice mushrooms into similar-size pieces. Remove the root and stem ends from an onion, as well as the tough, papery exterior layer. Cut into slices or dice into smaller pieces, making them similar in size to the accompanying mushrooms so that they cook evenly. 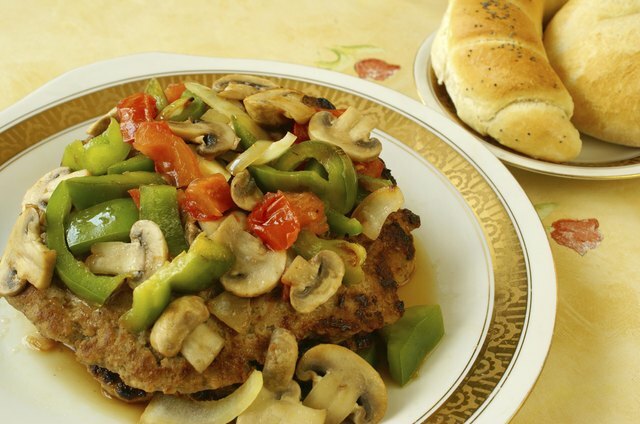 If using additional ingredients such as green bell pepper, slice or dice them to match the mushroom preparation. Add a teaspoon or two of oil or butter to a pan and bring to medium to medium-high heat; avoid adding too much oil as the mushrooms will absorb it. When the oil shimmers with heat or the butter has begun to bubble, add the onions to the pan and cook, uncovered, until translucent, approximately 3 to 5 minutes. Then add the mushrooms, stirring to coat with oil or butter. Sprinkle with salt and pepper, if desired. Cook, stirring frequently, for approximately 10 minutes. If adding peppers, introduce them to the pan near the end of the cooking time, depending on the level of crispness desired. Both the mushrooms and onions should be golden brown and caramelized in appearance, and the mushrooms should be tender, but not rubbery. Add any desired seasonings at the end of cooking, including fresh herbs such as rosemary, thyme or chives; seasonings such as garlic salt or cayenne pepper; or a few splashes of white wine, balsamic vinegar or soy sauce. Stir to incorporate. Once finished cooking, add mushrooms and onions to pasta sauces, layer on hot sandwiches such as Philly cheesesteaks, incorporate into stir-fries or use as a garnish for steaks. Try serving alongside baked green beans and grilled sausages or on top of warm, wilted spinach salads. Christina Kalinowski is a writer from the Twin Cities who began her career in 2011. She contributes food and drink related articles to The Daily Meal. She holds a Master of Arts in sociology from Purdue University. What Spices Go in Black-Eyed Peas?